If you're really looking to take your lower ab workouts to the next level, try including 1 leg piques on a stability ball. 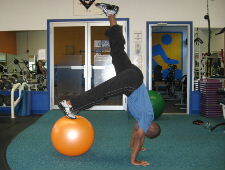 Regular piques are a great overall core exercise. They work your shoulders, abdominals, and hips all at the same time. 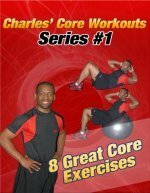 This is an advanced abdominal exercise that can place increased pressure on the shoulders and lower back. 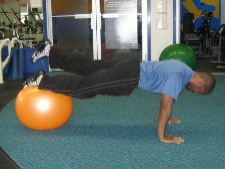 You should be able to do regular push ups and 2 leg stability ball piques before attempting this exercise. Starting Position: Begin by rolling out onto a stability ball until your feet are on top of the ball and your hands are underneath your shoulders in the push up position. Lift 1 leg slightly off the stability ball. Form: While keeping your abdominal muscles engaged and your legs straight roll the ball in towards your chest, and allow the opposite leg to point towards the ceiling. Hold just for a brief second and then return to the starting position. Personal Trainer Tips: This is an advanced ab exercise, so it is really important that you pay attention to the position of your lower back. If this exercise is too challenging, you can build up with 1 leg roll-ins on the stability ball. Read the page on lower abdominal exercise physiology to learn more tips for your lower ab workouts.